Admission $20 / members $15; included in overnight guest rate. A specially choreographed storytelling through dance, celebrating the empowerment of women through Goddess Durga. 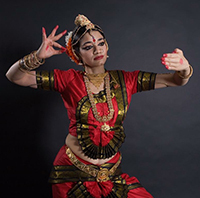 Performed by Sohini, world-renowned dancer and choreographer (Bharatanatyam-based). Preceded by Meditation Program beginning at 7:30 PM (by donation).